It's amazing that you're sitting reading these words at your computer; back in the 15th century, it would have been just as amazing to be reading them in a book. That was when printing technology hit the big time and the invention of the modern printing press made it possible for books to be reproduced in their hundreds and thousands instead of being copied out laboriously, one at a time, by hand. Although newspapers, books, and all kinds of other printed materials are now shifting online, printing is just as important today as it's ever been. Look around your room right now and you'll see all kinds of printed things, from the stickers on your computer to the T-shirt on your back and the posters on your wall. So how exactly does printing work? Let's take a closer look! 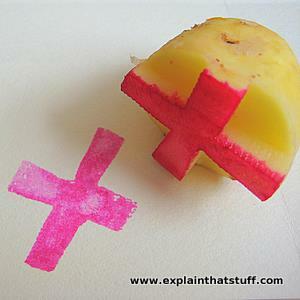 Photo: Potato printing: This is printing the way most of us learn it. It's an example of relief printing in which the ink is applied to a raised surface (the parts of the potato surface that haven't been cut away) before the paper is pressed onto it. Printing means reproducing words or images on paper, card, plastic, fabric, or another material. It can involve anything from making a single reproduction of a priceless painting to running off millions of copies of the latest Harry Potter. Why is it called printing? The word "printing" ultimately comes a Latin word, premĕre, which means to press; just about every type of printing involves pressing one thing against another. Although there are many different variations, typically printing involves converting your original words or artwork into a printable form, called a printing plate, which is covered in ink and then pressed against pieces of paper, card, fabric, or whatever so they become faithful reproductions of the original. Some popular forms of printing, such as photocopying and inkjet and laser printing, work by transferring ink to paper using heat or static electricity and we won't discuss them here; the rest of this article is devoted to traditional printing with presses and ink. Printing is hard, physical work so it's usually done with the help of a machine called a printing press. The simplest (and oldest) kind of press is a large table fitted with an overhead screw and lever mechanism that forces the printing plate firmly against the paper. Hand-operated presses like this are still occasionally used to produce small volumes of printed materials. At the other end of the scale, modern presses used to print books, newspapers, and magazines use cylinder mechanisms rotating at high-speed to produce thousands of copies an hour. Animation: How a traditional printing press works. 1) You put the original item you want to print from (typically metal type, black) face up on a table (light gray) and cover it evenly with ink (blue). You put the paper you want to print onto in a wooden frame and slide it along the table under the press. 2) The press consists of two blocks (dark and light gray) held together by a screw mechanism supported by a sturdy wooden frame (brown). 3) When you turn the lever, the lower block, called the platen (4), screws downward and presses the frame, containing the paper, tightly and evenly onto the inked type (5). Finally, you loosen the screw and remove the printed paper from the frame. The three most common methods of printing are called relief (or letterpress), gravure (or intaglio), and offset. All three involve transferring ink from a printing plate to whatever is being printed, but each one works in a slightly different way. First, we'll compare the three methods with a quick overview and then we'll look at each one in much more detail. Relief is the most familiar kind of printing. If you've ever made a potato print or used an old-fashioned typewriter, you've used relief printing. The basic idea is that you make a reversed, sticking-up (relief) version of whatever you want to print on the surface of the printing plate and simply cover it with ink. Because the printing surface is above the rest of the plate, only this part (and not the background) picks up any ink. Push the inked plate against the paper (or whatever you're printing) and a right-way-round printed copy instantly appears. Gravure is the exact opposite of relief printing. Instead of making a raised printing area on the plate, you dig or scrape an image into it (a bit like digging a grave, hence the name gravure). When you want to print from the plate, you coat it with ink so the ink fills up the places you've dug out. Then you wipe the plate clean so the ink is removed from the surface but left in the depressions you've carved out. Finally, you press the plate hard against the paper (or other material you're printing) so the paper is pushed into the inky depressions, picking up a pattern only from those places. Offset printing also transfers ink from a printing plate onto paper (or another material), but instead of the plate pressing directly against the paper, there is an extra step involved. The inked plate presses onto a soft roller, transferring the printed image onto it, and then the roller presses against the printing surface—so instead of the press directly printing the surface, the printed image is first offset to the roller and only then transferred across. Offset printing stops the printing plate from wearing out through repeated impressions on the paper, and produces consistently higher quality prints. 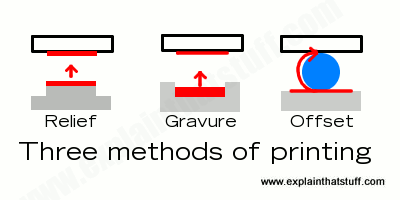 Photo: The three most common types of printing: Left: Relief—Raised parts of the printing block (gray) transfer the ink (red) to the paper (white rectangle with black outline at the top) when the two are pressed together. Middle: Gravure—Grooves dug into the printing block transfer the ink to the paper when the paper is pressed tightly into them. Right: Offset—A rotating cylinder (blue) transfers ink from the printing plate to the paper without the two ever coming into contact. For over 500 years now, most high-volume, low-quality printed material has been produced with letterpress machines, which are more or less sophisticated versions of the printing press Johannes Gutenberg invented back in the 15th century. In the simplest kind of letterpress, known as a flatbed press or platen press, the paper is supported on a flat metal plate called the platen, which sits underneath a second flat plate holding a relief version of the item to be printed (the printing plate, in other words). The printing plate is covered with ink (either by hand, with a brush or by an automated roller) before the paper is pressed tightly against it and then released. The process can be repeated any number of times. Photo: The keys in an old-fashioned typewriter produce images on paper by relief printing. When you press a key, these metal type letters flip up and press a piece of inked fabric against the paper. The letters are cast in reverse so, when they hit the paper, the printed impression comes out the right way round. Typewriters like this are now largely obsolete, but great fun to use—if a little noisy—when you can find them! Flatbed presses are generally the slowest of all printing methods, because it takes time to keep lifting and inking the printing plate and loading and removing sheets of paper. That's why most letterpresses use rotating cylinders in place of one or both of the flat beds. In one type of machine, known as a flatbed cylinder press, the printing plate is mounted on a flat bed that shifts back and forth as a cylinder moves past it, inking it, pressing the paper against it, and then lifting the printed paper clear again. That speeds up printing considerably, but loading and removing the paper is still a slow process. The fastest letterpresses, known as rotary webfed presses, have curved printing plates wrapped around spinning metal cylinders, which they press against paper that feeds automatically from huge rolls called webs. 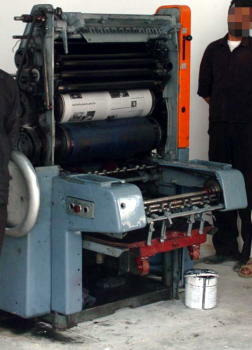 Newspapers are printed on machines like this, which typically print both sides of the paper at once and can produce thousands of copies per hour. The simplest kind of gravure printing is engraving, in which an artist draws a picture by scratching lightly on the surface of a copper plate that has been thoroughly coated with an acid-resistant chemical. Lines of shiny copper are revealed as the artist scrapes away. The plate is then dipped in acid so the exposed copper lines are etched (eaten much deeper into the metal) by the acid, while the rest of the plate remains unchanged. The acid-resistant chemical is then washed off leaving a copper printing plate, from which a number of copies, called etchings, can be printed. Traditional engraving and etching is quite a laborious process, so it's used mainly by artists to produce relatively small volumes of (originally) hand-drawn pictures. A similar but much quicker and more efficient process called photogravure is used commercially to produce large volumes of high-quality prints. Instead of being slowly and painstakingly drawn, the image to be printed is transferred photographically onto the copper printing plate ("photo") and then etched into it ("gravure"). Once the plate has been produced, it's used to make prints on either a flatbed press (fed with single printed sheets) or a rotary web press known as a rotogravure machine. Glossy magazines and cardboard packaging containers are often printed this way. The most common type of printing today uses a method called offset lithography (typically shortened to "offset litho"), which is a whole lot simpler than it sounds. As we've already seen, offset simply means that the printing plate doesn't directly touch the final printed surface (the paper or whatever it might be); instead, an intermediate roller is used to transfer the printed image from one to the other. But what about lithography? Photo: A modern offset printing press used to produce small runs of a weekly newspaper. Note the final printed copy on the top roller and the offset cylinder in the middle just underneath it. Photo by Senior Airman Dilia DeGrego courtesy of US Air Force. Lithography literally means "stone-writing," a method of printing from the surface of stones that was invented in 1798 by German actor and playwright Alois Senefelder. He took a large stone and drew a design on it with a wax crayon. Then he dipped the stone in water so the parts of the stone not covered in crayon became wet. Next, he dipped the design in ink, so the ink stuck only to the waxed parts of the stone and not the wet parts. So now he had an inked "printed plate" (or printing stone, if you prefer) that he could press against paper to make a copy. Lithography avoids the need to make a traditional printing plate, as you need for both relief and gravure printing. 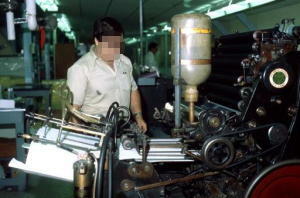 Photo: A small offset printing press. Note the paper sheets feeding in from the left and the rollers that transfer the paper and copy the image. Photo by J. Pond courtesy of Defense Imagery. Modern offset lithography printing presses use an updated version of the same basic idea in which the stone is replaced with a thin metal printing plate. First, the image to be printed is transferred photographically to the plate. The parts of the plate from which the image is printed are coated with lacquer (clear varnish), so they attract ink, while the rest of the plate is coated with gum, so it attracts water. The metal plates are curved around a printing cylinder and press against a series of rollers, which dampen them with water and then brush them with ink. Only the lacquered parts of the plate (those that will print) pick up ink. The inked plate presses against a soft rubber (offset) cylinder, known as the blanket cylinder, and transfers its image across. The blanket cylinder then presses against the paper and makes the final print. High-speed offset lithography presses are web-fed (from paper cylinders) and can produce something like 20km (~12 miles) of printed material in an hour! Relief, gravure, and offset are used to print the overwhelming majority of books, magazines, posters, headed stationery, and other printed materials that surround us, but several other methods are used for printing other things. T-shirt designs, for example, are usually produced with a process called silk-screen printing (sometimes called serigraphy). This involves covering the article to be printed (something like a blank cotton shirt) with a mesh-screen and a stencil, then wiping ink over the mesh with a brush. Ink transfers through the mesh to the fabric below except where it's blocked from doing so by the pattern on the stencil. Collotype (also called photographic gelatin) is a less commonplace technique in which a gelatin-coated printing plate is made from a high-quality original using a kind of photographic method. It produces finely detailed reproductions and is still used for making high-quality prints of paintings. Photo: Halftones: Here's the same photo up above as a newspaper might print it using different sized areas of black ink. If you squint, or look from a distance, you can see that it looks like it's been printed with many different shades of gray, even though it's really using only one color of ink (black). In practice, newspapers use much smaller dots than this—we've exaggerated greatly so you can see how it works. Photo by Senior Airman Dilia DeGrego courtesy of US Air Force, with simulated halftone treatment by explainthatstuff. Traditionally, printing presses used a single color of ink (black) to produce basic black-and-white text, but printing photographs and artworks was much more difficult because they really needed to be printed either with many colors or many shades of gray. That problem was solved when people discovered how to simulate shades of gray using what's called the halftone method. It's a simple way of converting photographs and drawings into images made from tiny black dots of differing sizes to give the impression they're made from many different shades of gray. In other words, it's a way of making a convincing gray-scale image using only black ink, and it relies on fooling your eyes through an optical illusion. To print in full color, you need to use at least four different inks: three primary ink colors and black. Most people know that you can produce light of any color by adding together different amounts of red, green, and blue light; that's how a television or LCD computer screen works. Colored inks work in a different way by subtracting color: they absorb some of the light that falls on them and reflect the rest into our eyes—so the color they appear is effectively subtracted from the original, incoming light. If you have an inkjet printer with replaceable cartridges, you'll know that you can print any color on white paper using the three colors cyan (a kind of turquoise blue), magenta (a reddish purple), and yellow. Theoretically, you can produce black with equal amounts of cyan, magenta, and yellow, but in practice you need a fourth ink as well to produce a deep convincing black. That's why full-color printing is often referred to as the four-color process, sometimes as CMYK printing (Cyan, Magenta, Yellow, and K meaning "key," a printer's word that usually means black), and sometimes (since each color has to be printed separately) as color-separation printing. Just like with black-and-white printing, the halftone process can also be used to create varying shades of color. 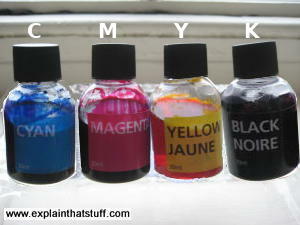 Photo: Color printing: With black, magenta, cyan, and yellow ink, you can print any color you like. Why is color printing more expensive? Printing in color costs much more than printing in black-and-white, for various reasons. First, and most obviously, there are four inks involved instead of just one and each is printed by its own printing plate, so the cost of making the printing plates alone is several times greater. Second, color printing presses need to be able to print the four inks on the page one after another, in perfect alignment, so they need to be considerably more sophisticated and precise. Third, it takes extra time and effort for the person operating the printer to check that the colors have been aligned and reproduced successfully, so there's more human effort involved. Finally, because color printing is often used for reproducing photographs, heavier, glossier, and more expensive paper is usually needed to do it justice. Sometimes designers get around the cost of color printing by using different colored papers and inks. So, instead of printing black ink on white paper, they might print black ink on red paper or red ink on yellow paper. That achieves a colorful effect but keeps the cost down by still using only a single color of ink. Another option is to use spot-color printing, where a single, specially mixed color is applied to a black-and-white document—though that is labor intensive and can work out even more expensive than four-color printing. Another alternative is to use two- or three-color printing, in which pages are printed with black and one or two other colors. If you were using just cyan and magenta inks, for example, you could create a whole range of reds and blues and print quite colorful pages without the expense of four-color printing. Another option is to print some pages with the four-color process and other pages with only black-and-white. Books that contain photographs are often made this way, with the art pages printed through the four-color process on glossy paper that's bound inside text pages printed with the black-and-white process on ordinary paper. If your immediate answer was "Johannes Gutenberg," you're only half-right. As this whistle-stop tour through printing history will show you, the celebrated German appeared only halfway through the story—one of many people who made printing what it is today. Artwork: A drawing of Ottmar Mergenthaler's revolutionary Linotype typesetting machine, taken from his original US patent #543,497: Linotype machine, courtesy of US Patent and Trademark Office. ~3000-1000BCE: Ancient Babylonia: People use signet stones (stones with designs cut into their surface) dipped in pigment (paint) to print their signatures in an early example of gravure printing. ~30BCE–500CE: Ancient Rome: Slaves laboriously copy out manuscripts by hand. 105CE: The Chinese invent the first paper, based on tree bark. ~500CE: The Chinese perfect printing from a single wooden block into which designs are slowly and laboriously engraved. ~751CE: A book called Mugujeonggwang Daedaranigyeong (The Great Dharani Sutra) is printed with wooden blocks. Today, it's believed to be the oldest surviving printed text in the world. ~900CE: Wooden block printing is further developed in Goryeo (a kingdom of Korea that lasted from the 10th-14th centuries). ~1040CE (11th century): A Chinese printer called Bi Sheng invents the idea of printing with movable type. He makes lots of small clay blocks, each containing a separate letter or character in relief, and rearranges them in a printing frame so he can print many different things. Unfortunately, because the Chinese language can use thousands of different characters, the idea doesn't immediately catch on; printers prefer to carry on using carved wooden blocks. 11th-13th centuries: In Goryeo, scholars produce the Tripitaka Koreana, a collection of Buddhist scriptures carved onto some 81,000 wooden printing blocks. 12th-14th centuries: The technology of papermaking is transferred from eastern to western countries. Late 1300s: Block printing is first used in Europe. 1377: In Goryeo, a two-volume book called Jikji (an anthology of Zen Buddhist teachings) is printed with metal type almost 80 years before Gutenberg. Only one copy survives, currently preserved in the National Museum of Korea in Seoul. 1450: Johannes Gutenberg develops the first modern printing press using movable metal type (with each small printing letter or character cast in relief out of metal). Note that he didn't invent either the printing press or movable type: his innovation was to bring these things together in a powerful new way that caught on and spread rapidly through the world. 1456: Gutenberg prints the famous Gutenberg Bible. ~1500: Thousands of printers have adopted Gutenberg's method and millions of books are being printed. 1798: German actor and writer Alois Senefelder invents lithography, the water-and-grease printing process used in modern offset printing. 1800: English nobleman Charles, Earl of Stanhope makes the first iron printing press. 1803: Brothers Henry and Sealy Fourdrinier invent the modern papermaking machine, based on a series of huge rollers arranged in a row. 1814: Long before electric power becomes widely available, Friedrich König invents the steam-driven printing press to speed up the laborious printing process. It's a type of flatbed cylinder press, in which the cylinder is powered by a steam engine. 1846: Richard March Hoe develops the rotary press for newspaper printing and later perfects it so it can print on both sides of the paper at up to 20,000 pages per hour. 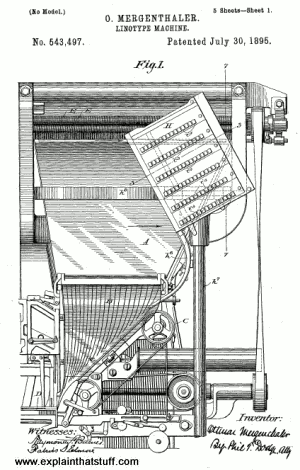 1863: William Bullock invents the web-feb rotary press for printing newspapers from giant rolls of paper. 1868: Christopher Latham Sholes develops a machine for printing personal letters and other writing—the typewriter with its QWERTY keyboard. 1880s: American brothers Max and Louis Levy develop halftone printing. 1886: Ottmar Mergenthaler invents the Linotype machine, an automated way of creating "hot metal" type in a printing plate by casting a whole line of a book or magazine at a time. Typesetting, as this innovation is known, allows newspapers to be printed more quickly and efficiently than ever before. 1887: American inventor Tolbert Lanston develops a rival typesetting system called Monotype, which sets each letter or character as a separate piece of type instead of a whole line. 1905: Ira Rubel develops offset printing. 1912: Walter Hess of Switzerland is one of the first people to experiment with lenticular printing (putting lenses over printed paper to make a 3D effect). 1938: Chester Carlson invents the basic principle of the photocopier (a way of reproducing documents almost instantly using static electricity), though another decade passes before the first commercial copier goes on sale and the invention isn't taken up widely until marketed by Xerox in the 1960s and 1970s. 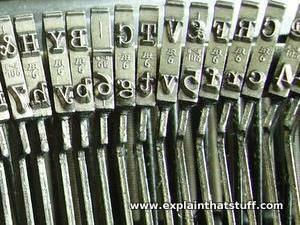 1949: Phototypesetting machines are invented, which produce type by photographic methods instead of using "hot metal." First is the Lumitype, invented at ITT by Frenchmen, René Higonnet and Louis Moyroud. and later developed by the American Lithomat corporation, which markets the machine as the Lumitype Photon. 1967: Gary Starkweather of Xerox gets the idea to develop a laser printer, and is finally granted a patent 10 years later. The machine he produces is very large and cumbersome by today's standards. 1980s: Scott Crump of Stratasys pioneers the modern approach to 3D printing called fused deposition modeling (bulding up a 3D object from hot plastic, layer by layer). 1984: Steve Jobs launches the Apple Macintosh computer (loosely based on the earlier Xerox Alto), which, partnered with a compact and (relatively) affordable laser printer, begins a revolution in desktop publishing. 1989: Tim Berners-Lee writes a proposal for an online publishing system called the World Wide Web, which makes it possible to publish documents instantly and view them anywhere else in the world, seconds later, using the Internet. Photographs of old printing equipment: A fascinating collection of photos showing historic printing equipment and prints from the Edinburgh: City of Print archive, compiled by the City of Edinburgh Museums in Scotland. Gutenberg Museum: A museum dedicated to the founding father of modern printing in Mainz, Germany. Click on the little English flag at the top for the English version of the text. Block Print: Everything you need to know to make fine-art prints with lino blocks, foam blocks, and stamp sets by Andrea Lauren. Rockport, 2016. A hands-on guide to printing from first principles. History of the Phototypesetting Era by Frank Romano. RIT Press, 2014. Phototypsetting was an important bridge between old-style manual printing and modern digital technologies. Printing Technology by J. Michael Adams and Penny Ann Dolin. Delmar, 2001. A review of traditional and modern, digital printing technologies. The Book: The Life Story Of A Technology by Nicole Howard. Greenwood, 2005. A complete review of the history of printing, from early papyrus to ebook. The Coming of the Book: The Impact of Printing, 1450–1800 by Lucien Febrve and Henri-Jean Martin. Verso, 2010. An economic, technological, social, and cultural history of book publishing.